Briefly stated, carbon capture and sequestration (CCS) will help us to sustain many of the benefits of using hydrocarbons to generate energy as we move into a carbon-constrained world. Even though the CO2 generated by burning hydrocarbons cannot always be captured easily in some cases (as in oil used for transportation), sequestration of CO2 from other sources (such as coal-fired power stations) can help to create, to some degree, the “headroom” needed for the volumes of CO2 that escape capture. Because of the likely continuing competitive (direct) cost of hydrocarbons and in light of the huge investment in infrastructure already made to deliver them, the combination of fossil fuel use with CCS is likely to be emphasized as a strong complement to strategies involving alternative, nonhydrocarbon sources of energy. Moreover, the exploitation of heavy oil, tar sands, oil shales, and liquids derived from coal for transportation fuel is likely to increase, even though these come with a significantly heavier burden of CO2 than that associated with conventional oil and gas. CCS has the potential to mitigate some of this extra CO2 burden. If we wish to sustain the use of oil, gas, and coal to meet energy demands in a carbon-constrained world and to provide time to move toward alternative energy sources, then it will be necessary to plan for and implement CCS over the coming decades. Subsequently, we should expect a continued need for CCS beyond the end of the century. The Earth emerged from the last ice age with atmospheric CO2 levels of approximately 280 ppmv (parts per million by volume). In the last century, CO2 concentrations have risen steeply to 380 ppmv. The recent rise is shown in Fig. 1, which combines ice core data (various symbols) with the direct measurements collected by Keeling (1960) since 1958 (shown in blue) and expanded on the right-hand graph. Fig. 1 - The rise of CO2 levels in the Earth’s atmosphere (IPCC 2007). Fig. 2 - Rise of global mean temperature since 1870 (IPCC 2007). At the same time that CO2 levels have risen, there has been a substantial increase in the mean global temperature as shown in Fig. 2, which shows yearly global temperature averages overlaid with decadal moving averages estimated by various independent teams. The link between elevated levels of CO2 in the Earth’s atmosphere and rising temperatures is well established (IPCC 2007). Most of the sun’s radiation comprises photons with frequencies well above the infrared, and these pass unimpeded through the Earth’s atmosphere. The Earth, however, by virtue of being much cooler than the sun, radiates much of its heat energy in the infrared band. This flux of infrared energy is subject to absorption and re-radiation by the greenhouse gases in the Earth’s atmosphere, leading to an overall warming of the lower atmosphere. Indeed, the warming influence of natural greenhouse gases over Earth’s history already accounts for global temperatures that are well above freezing. Without the greenhouse warming of water vapor and natural CO2, the Earth’s mean temperature would languish at 18°C below freezing, and we would not be here. The recent increases in anthropogenic (man-made) CO2 have led, over the last century, to a further rise in the mean global temperature of approximately 0.7°C. mechanisms proposed to account for the recent anomalous rise in temperature are either speculative (such as the proposed link between cloud formation and galactic cosmic rays) or insufficient to account for the measured temperature increase (as is the case with the historical variation in the heat flux from the sun). Furthermore, the recent rapid rises in temperature and in CO2 levels are not obviously correlated with any natural mechanisms (such as volcanoes, sunspot cycles, or variation in the Earth’s orbit). Marine air temperatures have increased by 0.4 to 0.7°C since the late 19th century. 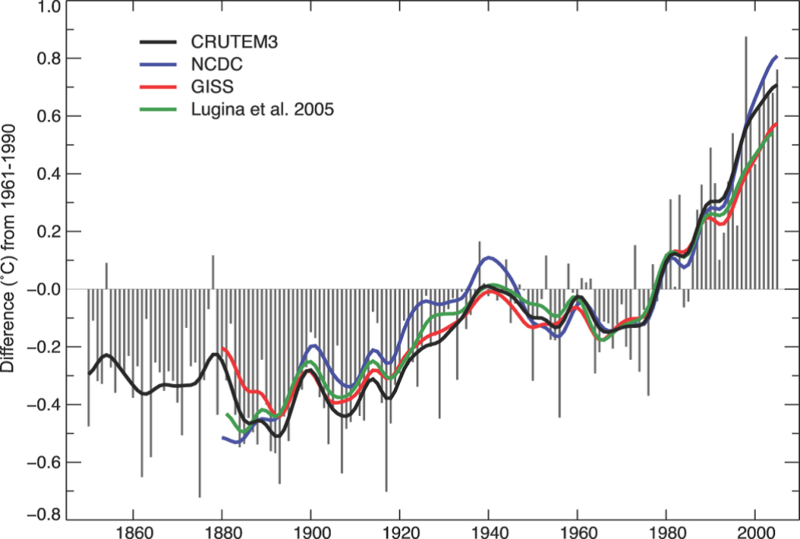 Sea surface temperatures have increased by 0.4 to 0.8°C since the late 19th century. Land nighttime temperatures have been increasing at twice the rate of daytime temperatures since 1950. Northern Hemisphere spring snow cover has decreased by 10% since 1987. There has been widespread retreat of mountain glaciers during the 20th century. 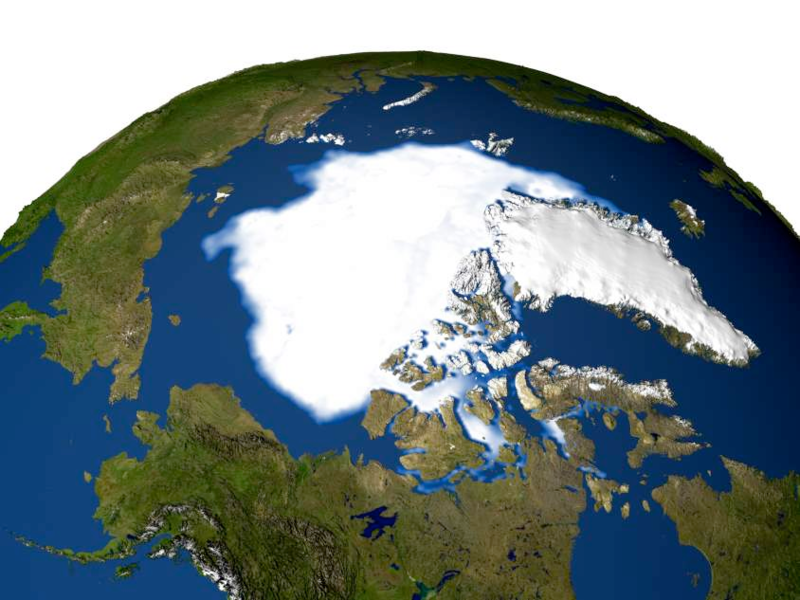 Since the 1950s, there has been a 10 to 15% reduction in the springtime extent of Arctic sea ice and a possible reduction of 40% in the late summer ice thickness. Of these, the reduction in Arctic sea ice is possibly the most alarming because it raises the prospect of an associated melting of the Greenland ice sheet itself. Fig. 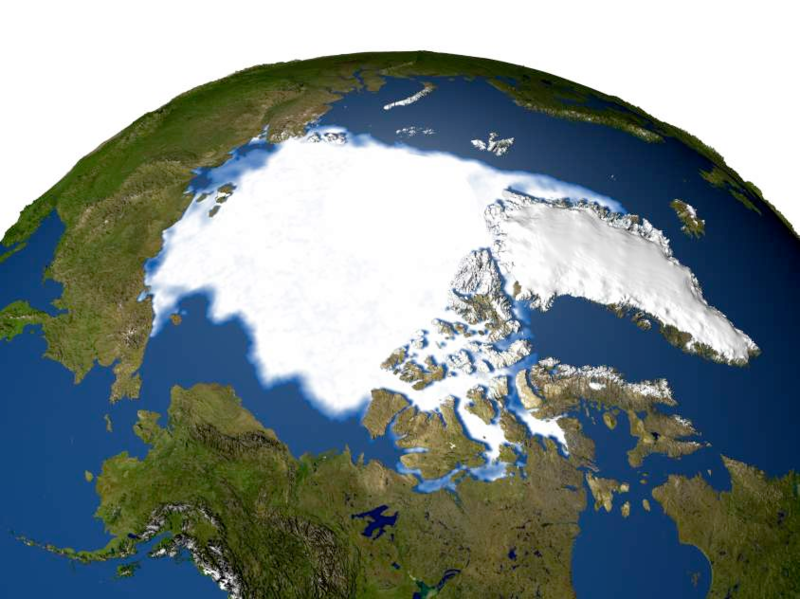 3 compares the minimum extent of the Arctic sea ice (captured by satellite after the summer melt) in 1979 and in 2005. The Intergovernmental Panel on Climate Change (IPCC 2001) outlined what we should expect if CO2 levels continue to rise unabated. –Could rise by several meters over a few centuries if the Greenland ice sheet melts significantly. Currently, we generate approximately 30 billion tons of CO2 each year. Natural emissions of CO2, largely from volcanoes, represent approximately 1% of this figure. Anthropogenic CO2 emissions over the last 2 centuries (Fig. 4) fully account for the 30% increase in atmospheric CO2 that has occurred over the same period. Fig. 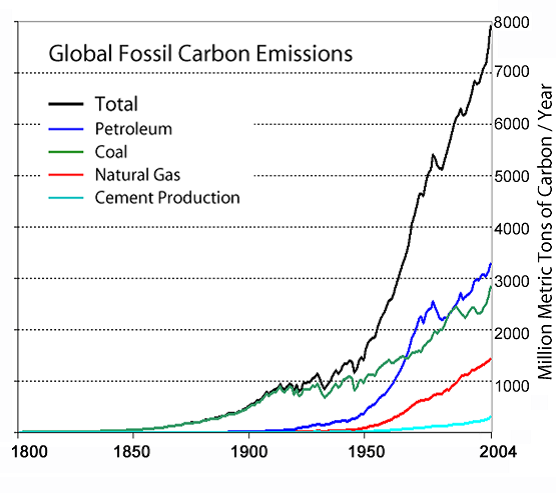 4 - Anthropogenic CO2 emissions since 1800 (IPCC 2007). Future levels of atmospheric CO2, and, subsequently, future levels of the associated global warming, will be largely determined by the future use of fossil fuels. Because fossil fuels are relatively inexpensive, almost all estimates of future energy requirements assume that fossil fuels will be the dominant energy source for much of the remainder of the century. Fig. 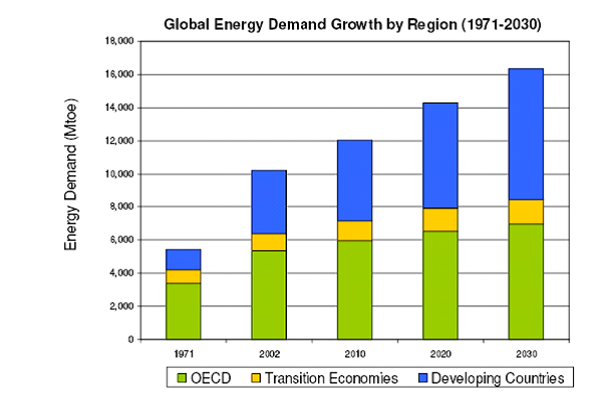 5 shows International Energy Agency (IEA) estimates for energy demand over the next 2 decades. Notice that by approximately 2025, the energy demand of the developing world outstrips that of the industrialized world. An immediate consequence of this is that measures to mitigate emissions of CO2 must involve strong intergovernmental cooperation between the industrialized nations and developing nations. If we are to avoid the economic and human consequences of severe climate change, we must significantly cut emissions of CO2. On the whole, the chief challenges to reducing CO2 emissions are not the technical ones, which, while not insignificant, are tractable; the real challenges are political and center on our ability to achieve intergovernmental cooperation between nations with different cultures and with competitive aspirations. In all cases where fossil fuels are the source of energy, CO2 is inevitably produced; if we are to prevent this CO2 reaching the atmosphere, CCS will be absolutely essential. CCS lends itself most readily to applications in which power is produced centrally (as in the case of coal-powered electricity stations). CO2 can be stripped from power-station emissions by a number of means, and these captured emissions can be compressed, transported, and stored. Two locations have been proposed for storing CO2: in the oceans and in geological structures beneath the Earth’s surface. While sequestration in the oceans is fraught with political and technical problems, geological sequestration, where supercritical CO2 is pumped into deep aquifers or spent oil and gas reservoirs, is likely to be far more tractable. Spent hydrocarbon reservoirs provide capacity for hundreds of billions of tons of CO2, while deep saline aquifers provide capacity for a hundred times this amount (Metz et al. 2005). Fig. 6 shows a variety of locations where CO2 could be effectively sequestered. Fig. 6 - Possible sites for geological storage of CO2. Security of sequestration is, of course, essential, although less demanding than in the case of nuclear waste. If sequestered CO2 can be effectively contained for periods of a few thousand years, then this will be sufficient to mitigate the impact of the captured CO2 on the Earth’s climate. The use of geological sequestration is currently being tested in a number of locations, and rapid adoption would render the task of capping CO2 emissions at their current levels at least feasible. Nevertheless, this is not to underestimate the need to address the details of implementation, which will include adequate candidate selection, materials issues (cements and steels), approaches to monitoring and controlling CO2 migration, and the logistics of matching centralized power stations to suitable geological locations. The oil industry is well equipped to meet these challenges because much existing oilfield technology lends itself to geological sequestration of CO2. Note: This discussion was originally presented in “Sustaining Fossil Fuel Use in a Carbon-Constrained World by Rapid Commercialization of Carbon Capture and Sequestration” by Sheppard and Socolow in the December 2007 issue of AIChE Journal. Capturing CO2. Coal-fired power stations represent a dominant source of the world’s current CO2 emissions. A 500MW power station vents about 3 million tons of CO2 to the atmosphere each year. Currently, most power stations burn pulverized coal in air, and CO2 is emitted at concentrations somewhere between 3 and 15% along with the other flue gases. Extracting the CO2 is not ideal in these circumstances because of the low concentration, but can be achieved with solvents or, potentially, membranes. Although there is as yet no full-scale CO2 extraction practiced on existing coal plants, such extraction is conducted elsewhere using, for example, the dissolution of CO2 in a monoethanolamine solvent (MEA). Dissolution takes place at temperatures around 38°C, and the captured CO2 can be subsequently released by heating the solvent to a temperature of 150°C to produce a concentrated CO2 stream that can then be compressed and transported to a sequestration site. This extraction process is inefficient, however, and consumes about 30% of the energy produced to release the CO2 from the MEA. Things can be improved somewhat by burning the coal in a high-concentration oxygen stream. This so-called “oxyfuel” process leads to a much higher concentration of CO2 in the flue gases, but there is still a 28% energy cost associated with the cryogenic separation of the oxygen at the front end of this process. Much more effective, from an overall efficiency point of view, is an Integrated Gasification Combined Cycle (IGCC) process, which characterizes plans for “next generation” coal plants. This process involves treating coal at high temperature with steam to induce a series of shift reactions that will produce a mixture of CO2 and H2 prior to combustion of the hydrogen to generate power. Extraction of the CO2 from the pre-combustion stream is potentially more efficient than in the post combustion case, and the overall cost of capture would be reflected in an increase of the retail price of the electricity produced of about 20% (Socolow 2005). Along with CO2 capture from power plants, there are other opportunities for capturing CO2 at high concentration. There is frequently an exhaust stream of nearly pure CO2 associated with hydrogen produced from natural gas, petroleum, or coal for direct use in refineries or as a precursor to ammonia production at fertilizer plants, and elsewhere, natural gas emerging at the wellhead contains CO2 at a wide range of concentrations. Storage of CO2 in Geological Formations. Unless the power plant from which the CO2 is captured is located at the sequestration site, there is a requirement to transport the CO2 over possibly large distances. However, such transportation is already an established technology, and the associated costs are relatively low. CO2 pressurized to above 8 MPa can be transported in pipes. Currently in the US, more than 40 Mt of CO2 a year is distributed through a network of over 2500 km of pipes (Metz et al. 2005). CO2 can also be transported as a low-temperature liquid in ships or by road or rail. The volumes of CO2 that need to be dealt with, however, are large. Emissions of CO2 currently run at over 30 billion tons a year, and sequestering just a tenth of this would entail pumping about 75 million barrels of supercritical CO2 per day into geological formations. At the level of an individual power plant, sequestering CO2 from a 500-MW coal-fired power station would require pumping around 75,000 B/D1 of supercritical CO2 into a suitable formation. The expertise and the technologies needed to sequester such volumes already exist to a large degree within the oil and gas industry. Several demonstrations of CO2 sequestration already are underway, including the In Salah saline formation project in Algeria (Riddiford et al. 2004) and the Sleipner project in the Norwegian North Sea. In the latter (Fig. 7), Statoil has successfully pumped more than 1 million tons of CO2 per year for the last 10 years into the deep saline Utsira formation, which lies approximately 1000 m beneath the seabed and is capped by a low-permeability shale layer. 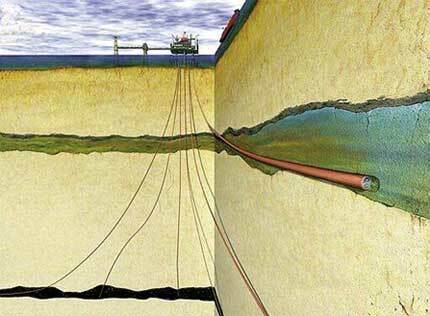 The supercritical CO2 is pumped into the bottom of the formation and subsequently migrates upwards due to buoyancy until it reaches the sealing shale level at the formation’s top. Fig. 7 - Schematic of Statoil’s Sleipner CO2 Injection Project in which, over the last 10 years, approximately 1 million tons/yr of CO2 have been injected into the Utsira formation roughly 1000 m beneath the seafloor. At depths greater than about 600 to 1000 m, CO2 will exist as a supercritical fluid with a specific density of somewhere between 0.6 and 0.8 (Holloway 2007). The supercritical CO2 is buoyant in the saline formation waters and will rise until it encounters a seal. A determination of the effectiveness of such seals will be an essential part of the appraisal of suitable sites for CO2 storage. While the seal integrity of exhausted oil and gas wells will be relatively well known, deep saline aquifers will be less well-understood, and appraising such formations for secure storage will represent a significant challenge. In addition to the immobilization of buoyant supercritical CO2 under a seal, some of the injected CO2 also will be trapped along its migration path by capillary forces. This “residual trapping” may account for between 5 and 30% of the injected volumes (Holloway 2007) and will represent a significant component of the overall storage. Within the formation, the trapped supercritical CO2 will dissolve in the brines with a time scale of a few thousand years. At the same time, the dissolution of CO2 renders the brines denser than the surrounding fluid so that they will sink over time. Dissolution of CO2 also makes the brines more acidic, causing them to dissolve carbonate and aluminosilicate minerals. This leads, in turn, to the precipitation of solid carbonates over time scales of hundreds to thousands of years. The detailed modeling of these geochemical mechanisms will be an essential ingredient of the prediction of the long-term fate of geologically sequestered CO2. Subsequent Leakage of Stored CO2. If the seal of the storage volume is compromised by fractures or faults, or if there are gaps in the seal, then the CO2 can leak into upper formations. The subsequent migration of the released CO2 will then be determined by the permeability of these overlying formations to CO2. Furthermore, the process of injecting the CO2 may initiate failures of the seal and, if inadequately contained, dissolved CO2 may migrate with the flow of brine to locations where it can escape to the atmosphere or to a body of water. A critical aspect of CO2 storage will be the monitoring of these possible processes, and techniques will likely include repeated seismic surveys, gravity surveying, and other techniques already available within the oil and gas industry. Leakage Through Old Wells. Where CO2 storage is sought in spent oil and gas wells, the infrastructure of the existing wells present a particular problem because these wells by design penetrate the seals that serve to secure the sequestered CO2. Even if cement integrity is initially good, the cements for these wells are prone to attack by brines rendered acidic by CO2 dissolution. In general, the overall condition of the cementing of existing wells will probably be only poorly known. While there is potential for remediation of poorly cemented wells, the overall leakage potential in such circumstances is poorly constrained, and significant further research on the long-term integrity and remediation of abandoned wells will be needed. CO2 is already pumped into oil reservoirs for enhanced oil recovery (EOR), although most of the CO2 currently used for EOR comes from natural sources, and existing EOR practices are not implemented with a view to storing CO2. However, it would be possible to modify CO2 EOR to emphasize CO2 storage while at the same time improving oil recovery. 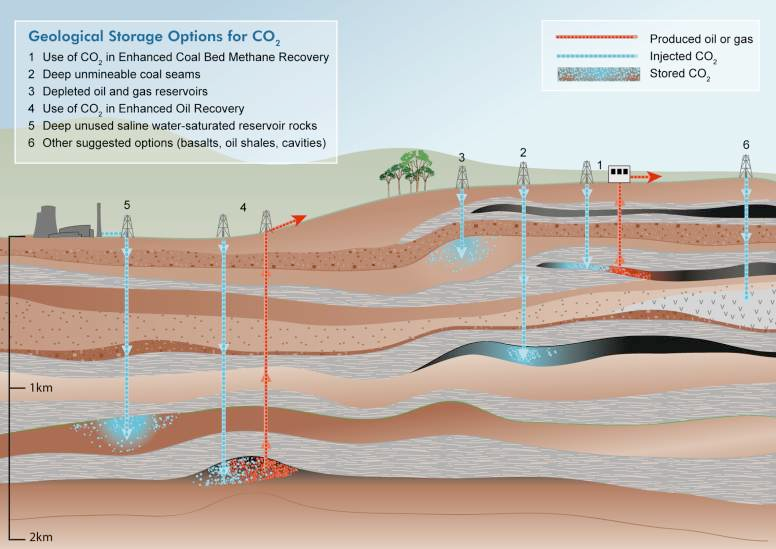 Although CO2 EOR would not provide accommodation for more than a very small fraction of the volume of CO2 currently emitted, it does provide a laboratory for technologies required for routine sequestration that is driven by the commercial incentive to improve recovery of the oil from older reservoirs. Moreover, in a world where CO2 is much more readily and cheaply available, there will be an incentive to use CO2 earlier in the oil-recovery stage to better exploit dwindling resources. The technological hurdles to effective implementation of CCS are surmountable. However, the legislative framework within which CCS is conducted will have a major impact on how rapidly the technology is implemented and ultimately determine whether CCS can play a substantial role in the mitigation of carbon emissions and thereby facilitate access to future hydrocarbon supplies. 1 3 MtCO2/yr per 0.5 GW =8,500 tCO2/day, = 75,000 bbl CO2/day at 9 bbl per ton (specific gravity of 0.7). 2G8 International Energy Agency (IEA) & Carbon Sequestration Leadership Forum (CSLF) First Workshop on Near Term Opportunities, held 22–23 August 2006, San Francisco. Holloway, P. 2007. Carbon Dioxide Capture and Geologic Storage, Trans., R. Soc. A 365: 1095–1107. Intergovernmental Panel on Climate Change (IPCC). 2001. Third Assessment Report. http://www.ipcc.ch/publications_and_data/publications_and_data_reports.htm. Downloaded November 2010. Keeling, C.D. 1960. 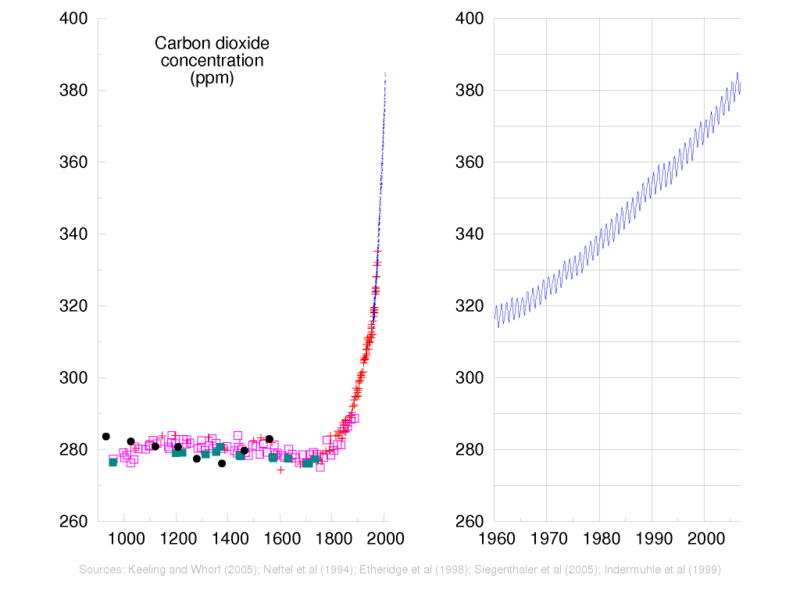 The concentration and isotope abundance of carbon dioxide in the atmosphere. Tellus 12: 200–203. Metz, B., Davidson, O., Meyer, L., and deConinck, H.C. eds. 2005. IPCC Special Report on Carbon Dioxide Capture and Storage. Cambridge, UK: Cambridge University Press. National Petroleum Council. 2007. Facing the Hard Truths About Energy. Riddiford, F., Wright, I., Espie, T., and Torqui, A. 2007. Monitoring Geological Storage: In Salah Gas CO2 Storage Project. Presented at IEA GHGT-7, Vancouver, BC, Canada. Socolow, R. 2005. Can We Bury Global Warming? Scientific American (July 2005). Sheppard, M., and Socolow, R. 2007. Sustaining Fossil Fuel Use in a Carbon-Constrained World by Rapid Commercialization of Carbon Capture and Sequestration. AIChE J. 53: (12) 3022–3028.